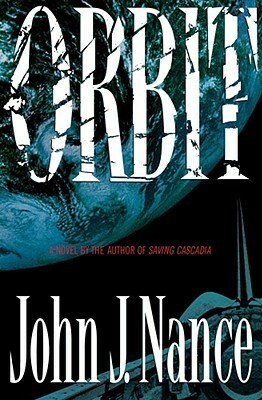 I bought a signed copy of Orbit by John J. Nance from Chinaberry for my husband for Christmas. Of course, the best thing about buying a loved one a good book is that you get to read it, too! Orbit is a gripping suspense novel, the kind that is easily devoured in a couple of days. The plot is unique and intriguing, pulling you in immediately. Kip Dawson is a typical American husband and father who wins a contest with a prize that will fulfill his lifetime dream: to travel in a spacecraft. It's 2009, and private space travel has become a reality. Kip's prize includes two weeks of ground school, followed by a flight in a small spacecraft that will orbit Earth several times. Of course, some problems crop up, and Kip eventually finds himself alone in the tiny ship, miles above the Earth. It's a classic Gilligan's Island "3-hour tour" set-up. After that, though, Orbit takes off on its own path. While Kip is trying to figure out how to get back on the ground safely, he discovers an onboard laptop computer and begins typing a personal journal. He knows there's a good chance he won't survive, and typing his thoughts and the story of his life provides an outlet for him and perhaps, he thinks, a record of what happened for some future generation. Since the ship no longer has radio contact with the ground, Kip is unaware that everything he types is being instantly downloaded through an internet connection and read by millions of people all over the world. Kip's physical situation provides plenty of suspense to the story, while his journal and its effects on his family and the rest of the world give the book an emotional depth that's often missing from suspense novels. It's fascinating to listen in on the thoughts of a man who believes he'll be dead in a few days. This is the first book of John Nance's that I've read (he's published seventeen prior novels). Both my husband and I thoroughly enjoyed the fast-paced, thoughtful Orbit. There are several books that my neighbor/book group buddy has lent me, including The Glass Castle by Jeannette Walls. I've heard from many people that this is an excellent book, and I love memoirs, so it's certainly tempting. I'm wondering if my other book group might be interested in reading it, though, so I set it aside for now. I have a couple of classics that I've been meaning to read. My list of "Great Authors I Can't Believe I've Never Read" is fairly long. My stack currently includes two from that list: Emma by Jane Austen and Breakfast of Champions by Kurt Vonnegut. Then there are some favorite authors waiting in my stacks. I Know This Much Is True by Wally Lamb is on my shelf, but I loved She's Come Undone so much that I don't want to devour this one too quickly. I borrowed Summer Sisters from my mother-in-law at Thanksgiving. I don't expect it to be great literature, but I loved Judy Blume as an adolescent. I almost started that one today. I have several books I've borrowed from my mother, including Mrs. Kimble by Jennifer Haigh. I read about this one in the Bas Bleu catalog awhile back and have wanted to read it ever since. Ken bought me The Curious Incident of the Dog in the Night-Time by Mark Haddon for Christmas, but it's one my book group is considering, so I decide to wait. On Ken's side of the bookcase, there is a similarly enticing stack, many of which I chose for him with the intent of reading them myself! He's got Grisham's first foray into non-fiction, The Innocent Man, which my mom brought over this weekend and said was great. I gave him Richard Ford's Independence Day for Christmas, but he says he'll have to reread The Sportswriter first. That would be a two-book commitment for me, too, so I hold off for now. I also gave Ken Orbit by John J. Nance from the Chinaberry catalog and can't wait to read it myself. Our son, Jamie, gave Ken House of the Scorpion by Nancy Farmer, a young adult sci-fi thriller whose cover is cluttered with awards, but it sort of seems unfair to read his gift before he does. Finally, I have piles of middle-grade/young adult review books. I picked up Isabel Allende's Forest of the Pygmies today but saw it was the third in a trilogy, so I guess I better read the first book first. This was the first year I’ve kept track of what I’ve read, so I thought it would be fun to take a look back at my year of reading. I read about 45 books this year on my own and read aloud another 10 – 12 to our boys at bedtime (and I may have missed a few!) I’m definitely reading more – and a much wider variety – than I used to, and I’m enjoying my fuller reading life immensely. Here are some of my favorites from this year, including a few that make my Favorite Books Ever list as well. She’s Come Undone by Wally Lamb. I was stunned by Lamb’s writing. I read this book non-stop over the course of a few days, driving my husband crazy because I hardly set it down. I lived and breathed the world of Delores for days, thought about her, and even dreamed about her. Lamb (a man, no less!) has an incredible ability to make Delores real, and the story of her life is the story of real life, full of pitfalls and joys and overcoming adversity. I recently grabbed a second-hand copy of Lamb’s other masterpiece, I Know This Much Is True, and I can’t wait to dive in and lose myself again. To Kill a Mockingbird by Harper Lee. How did I live for 41 years without reading this compelling classic? I’m embarrassed to admit I once thought it was a book about hunting! The characters, the plot, the setting, and the background of 1940’s southern segregation all kept me captivated. Definitely on my best-of-all time list. The Ride of Our Lives by Mike Leonard. I saw Mike Leonard’s video clips on the Today show about his trip across the U.S. with his parents and couldn’t wait for his book to come out. It was wonderful – a combination travelogue and tribute to his parents and grandparents. The book was funny, touching, and inspirational and made me wish I could hang out with the Leonards. My husband enjoyed it as much as I did. The Kite Runner by Khaled Hosseini. I’m probably the last reader alive to finally discover this best-seller. My book group read it last winter, and I missed the meeting but eventually got to the book last month. Wow. It was just as incredible as everyone had told me. Engaging and entertaining but also very educational, the book drew me in. I came to care for the characters. The story itself was compelling and had emotional depth, and I learned so much about Afghanistan and its people. Books like this are so important in our global community; they help us to recognize the basic humanity that we all share, no matter what our religion or culture. March by Geraldine Brooks (won the Pulitzer Prize for fiction in 2006). I thought I didn’t like historical fiction before I read this book for one of my book groups. I loved it and never wanted it to end. Set during the Civil War, it tells the story of Mr. March, father of the famed Little Women, and what happens to him while he’s away from his family serving as a minister in the war. His story and his character were compelling, but I was also transfixed by the details of the war, slavery, and plantation life. The Memory of Running by Ron McLarty. The plot sounds a little strange, but this book has plenty of heart. It’s the story of a man considered by himself and everyone else to be a complete loser – overweight, chain-smoking, drinks too much, and stuck in a dead-end job. Then, his beloved parents die in a car crash. In his grief (and drunken stupor), he takes off on his childhood bike and ends up on a trip from his home state of Rhode Island all the way across the U.S. to California. It’s the tale of his life-changing journey, both physical and emotional. The Ha-Ha by Dave King. My aunt lent me this book, and I was surprised to find myself captivated by its unusual main character. Howard is a Vietnam vet whose head injury left him unable to speak or write. His life of silent isolation is interrupted when an old girlfriend leaves her nine-year old son in his care while she checks into rehab. While the cautious relationship between the two might seem predictable at first, there are plenty of surprises and emotional depth, and the story never becomes overly sentimental. I found myself thinking about Howard long after I’d finished the book, always a sign of a good read. I can't wait to see what wonderful books 2007 will bring!